Bob Kurland is a self-described “retired, cranky, old physicist” and convert to Catholicism. He blogs at Reflections of a Catholic Scientist, where this piece first appeared. 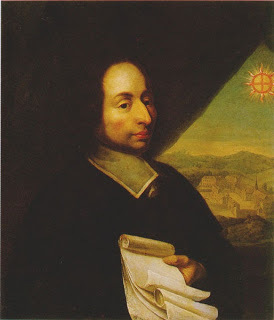 Among the pile of Pascal’s papers that were to be the Pensees was found a proposition that has kept philosophers and theologians occupied for the last 350 years, Pascal’s wager: betting on God is the prudent option. (Notes, below, 1-8) What new insights can one bring to this, then, after all this time? I will try to understand the wager from a perspective of contemporary decision analysis, for which the wager was possibly the first instance, and also comment on what happens after one accepts the wager. Pascal spoke as a counselor of gamblers, for whom (with Fermat) he had developed the first quantitative version of probability analysis. It will be useful, before the wager is recast in a more quantitative format, to give some mundane examples. 3) a sure thing—an unreported diamond mine in Northern Scotland that your Uncle Angus has told you about—you’ll double your investment. The table below summarizes the possible outcomes; the columns represent “state of nature”, that is “good” outcome for a particular option and “bad” outcome ( a — sign means a loss), the rows, the different options. If you’re an optimist, you would of course choose the diamond mine. If you are a pessimist or risk-averse, you would choose the option with the least possible loss, the Savings Account (you would follow what is called the mini-max principle in decision analysis (9), choosing the option with minimum possible loss). There aren’t numbers here, but clearly the value for belief in the existence of God (and the afterlife), X, is much greater than Y (the loss -Y one sustains by belief) or Z (the gain of a possibly hedonistic life that one sustains by unbelief), so the minimum worst regret (least negative) is that for belief in God. If probabilities for outcomes are known or can be estimated, another approach is to use expected values for each option and choose the option with the maximum expected value. To get an expected value you multiply each outcome value by the probability for that outcome and sum these products for all the outcomes for a given option. Pascal did not presume to give a probability for the existence of God and the afterlife. However he relied on the infinite value of the outcome to give an infinite expected value—any number (however small as long as it’s not zero) times infinity is infinity. And as long as the imputed loss is finite, the expected value will be infinite. This assumption has raised the hackles of philosophers, and counterexamples—such as mixed strategies (2,10) and the “St. Petersburg Paradox“—have been proposed to show how the assumption of an infinite value outcome leads to problems. If the odds are greater than the possible loss to gain ratio, then one should make the wager. For example, if you believe that the odds for Great Britain winning the World Cup are 2 to 3 and the bookmakers are giving 1 to 8 odds for Great Britain (win 8, lose 1), you should bet for, and not against Great Britain. 6) those who believe in an afterlife but in their evil, like Satan, would rather live in Hell than serve the Lord. Endeavor then to convince yourself, not by increase of proofs of God, but by the abatement of your passions. You would like to attain faith and do not know the way; you would like to cure yourself of unbelief, and ask the remedy for it…There are people… who are cured of an ill of which you would be cured. Follow the way by which they began; by acting as if they believed, taking the holy water, having masses said, etc. (1128) “The sacrament is not wrought by the righteousness of either the celebrant or the recipient, but by the power of God.” (emphasis added). …at each step you take on this road you will see so great certainty of gain, so much nothingness in what you risk, that you will at last recognize that you have wagered for something certain and infinite, for which you have given nothing. As a personal note, let me add that Pascal was right and I’ll say more about this in a forthcoming blog, “Top Down to Jesus–Bypassing the Road to Damascus”. Editor’s Note: It should be emphasized that the Wager was not meant as a proof for God, and that a different wager exists for each religion one encounters. The real purpose Kurland outlines well in his last section. 1. Nicholas Rescher, Pascal’s Wager—A Study of Practical Reasoning in Philosophical Theology (Notre Dame: University of Notre Dame Press, 1985). 3. Daniel Garber, What Happens after Pascal’s Wager—Living Faith and Rational Belief (Milwaukee: Marquette University Press, 2009). 4. Itzhtak Gilboa, Theory of Decision under Uncertainty (Cambridge: Cambridge University Press, 2009), pp. 38-40. 5. Bas C. van Fraassen, Laws and Symmetry (Oxford: Clarendon Paperbacks, 1989), pp.52-53. 6. James A. Connor, Pascal’s Wager—The Man Who Played Dice With God (San Francisco: Harper and Collins, 2006). 7. All quotations are from Blaise Pascal, Pensees tr.by W.E. Trotter (Mineola, NY: Dove Philosophical Classics, 2003), #233, pp. 65-69. 8. Paul Bartha, “Taking stock of infinite value: Pascal’s wager and relative utilities.” Synthese 154 (2007), 5-52. 10. ibid, pp. 377, 387. And since I am quite sure he was an atheist I just gave him a little dilemma; either he has to believe in God if he stands by his “disastrous consequences” argument, or drop the argument if he insisted in being an atheist 😀 haha. FTW. How does one “CHOOSE TO BELIEVE”? Choosing is not belief…it is self delusion…or its precautionary (e.g. “I’m not sure, so I’ll behave accordingly just in case). Pascal’s argument is precisely, exactly, like the mobster’s fallacy where the hoodlum tells the small store owner to “contribute” to his welfare program out of personal affection (or other such window-dressing lies). Better to pay the hood for “protection” (from the hood) than get shaken down, beaten, etc. And if the hood wants to frame the perpetual payoffs as a willful, charitable, voluntary contribution to his “welfare” program, so be it. Basically the modus operandi of organized crime rackets (pay up or else) and god’s (believe…and pay tithe $$ to the local church) are precisely the same… Think about that. People “believe” because the evidence is compelling to support the belief…not because they’re being bribed on the one hand & threatened on the other. We are missing what Pascal was really up to. The wager was not an argument for belief. Pascal was a very subtle thinker on the subject of belief, and would never have said that. Rather, he is starting from the words of Jesus, “Seek and you shall find.” If you are a seeker, you will find Truth, either in this world or the world to come. Pascal wrote something really odd-sounding, to the effect that the “happy atheist” is doomed. But the believer AND the “unhappy atheist” will both be saved. By unhappy atheist he meant someone who is not content with not knowing God, and continues to seek Him. Pascal lived during a great gambling mania. The young friends whose souls he was concerned about gambled recklessly. The gambling analogy was meant to tease them into being seekers. Into being restless and discontented with their spiritual situation. If one observes, where it occurs in religion, the requirement to “believe” also includes the subtle requirement to believe a particular message. The above are typical — one must believe in Christ AND believe in the words presented. Those particular words are from the 2nd Book of Nephi, 33:10, from the Book of Mormon. …one should “choose” to believe in the Mormon version…and the R. Catholic version…and….best to cover all the bases…just in case…. Of course that’s absurd. Besides, each faith invariably includes the stipulation that one must believe their particular version and reject all others. And behavior modification (aka “brainwashing”) — all those rituals & prayers (e.g. Islam’s requirement to pray 5x’s/day; the Catholic rosary; etc. ), fasting–sure to diminish critical thinking skills & make one’s mind much more malleable–all are consistent with psychological behavior modification practices. SO, what does an outsider do when confronted with so many mutually-exclusive, and mutually rejecting, faiths? Logically, one examines them objectively, examining the evidence (e.g. J. Smith’s revelation via tools, “seer stones,” he was convicted of long before for helping farmer find lost tools; J. Smith’s loss of a revealed book by a wife who “lost” it to see if he could reproduce it — he couldn’t…are enough to raise serious doubts in most….except converts & those brought up from childhood…etc.). What one observes, however, among those who’ve been indoctrinated is a very powerful amount of mental effort expended on avoiding looking at any fact that challenges what they think they know. When forced to look at such facts the next common tendency of choice is to examine only part of it–a distortion–or to misrepresent it–lie about what it really is (another distortion), etc. Or, they resort to medieval modes of thinking that are certain to evade entire blocks of enlightening facts. Ms. C dies and goes to hell, where The Devil offers a game of chance. If she plays today, she has a 1/2 chance of winning; if she plays tomorrow, the chance will be 2/3; and so on. If she wins, she can go to heaven, but if she loses she must stay in hell forever. When should she play? The answer is not clear. If she waits a full year, her probability of winning will have risen to about 0.997268. At that point, waiting an additional day will improve her chances by only about 0.000007. But at stake is infinite joy, and 0.000007 multiplied by infinity is infinite. And the additional day spent waiting will contain (presumably) only a finite amount of torment. So it seems that the expected benefit from a further delay will always outweigh the cost. â€œThis logic might suggest that Ms. C should wait forever, but clearly such a strategy would be self-defeating,â€ wrote Edward J. Gracely in proposing this conundrum in Analysis in 1988. â€œWhy should she stay forever in a place in order to increase her chances of leaving it? I didn’t write the essay. Plus, you’re marvelously wrong that “Pascal’s argument is precisely, exactly, like the mobster’s fallacy…” Not one of your particulars is true. But it is curious that it is not an uncommon mistake. About that, more later. Update Just saw your gambling example, which fails. You have ignored one of the infinities (which are dangerous creatures). You forgot the “negative” infinity which represents losing and staying in Hell. So regardless of probability of winning/losing you have one infinite expected value compared with another. Dangerous, that. This is why your “solution” violates common sense. The person should just wait (is Hell in time?) and then play with every expectation of winning. “I have wished a hundred times over that, if there is a God supporting nature, [nature] should unequivocally proclaim him, and that, if the signs in nature are deceptive, she should suppress them altogether”â€”but nature prefers to tease, so she “presents to me nothing which is not a matter of doubt” (Pensee #429). As I discussed on a previous post, there are also what you might call the “poly-atheists” and “poly-agnostics”. A monotheist believes in one God, a polytheist believes in many Gods. But a poly-atheist *disbelieves* in many Gods, and the poly-agnostic is unsure. Pascal’s argument is built around the mono-agnostic, who does not know if God exists but assumes that if he does he fits the monotheist Christian theology. You might not know the odds, but you do know the costs. However, a poly-agnostic will ask you “Yes, but which God?” If you get the right one you can expect an afterlife of infinite joy. But pick the wrong one, and you face the penalty of unbelief with an angry God (or Goddess) there to extract it. There is an infinite cost, too. How many Gods might there be? Thousands have been worshiped by humanity over the millenia. Millions are thought to exist in some theologies. It might even be infinite. And they do not like each other! Fights between Gods are a common subject of mythology, and smiting the followers of false/rival Gods a common injunction to the faithful. So it’s probably a safe bet that if you turn up in the afterlife and happen to be a fan of a big rival of the God you’re facing, you are not going to be Mr Popular. You are going to be facing some Wrath. And of course any finite cost of atheism beats a negative infinity. Pascal’s wager is of course an example of the false dilemma fallacy. In this fallacy, two choices are presented as if that’s all there are, and the undesirability or impossibility of one is used to argue for the other. But there are in fact many other options, which have different consequences and costs. And as alluded to above, it also appears as the Precautionary Principle fallacy. A famous example being Greg Craven’s proof that you ought to act to prevent Global Warming even if you didn’t believe in it. It’s a standard rhetorical technique to bypass the need for evidence by raising the stakes. I suppose the question would be, can you come to believe in any God by following the rituals? If one only comes to believe by God’s power, then this would enable experimental evidence of God’s existence and identity. It would become a testable, scientific proposition. Indeed, you could experimentally explore many other major questions of theology and the occult and supernatural universe, simply by trying to believe them and seeing if you eventually do. Isn’t the answer to Pascal’s wager that one should wait for a death bed confession? The incentive to believe will be highest then and thus most effective. Also, where does John Calvin’s predestination fit into all of this? Does it make the wager irrelevant? Come on, Briggs, Ken’s Gambler in Hell paradox was great. I think that Pascal was under a lot of pressure when he came up with this. Sorry, I just can’t be serious on this topic. What would be the odds that I would enter heaven if I were to believe ever other day? Not to nit, but as an Atheist with a strong affinity for Buddhism, the Buddha was not a God and Buddhism is not a religion. Pascal disagrees with St. Paul then who finds us “without excuse”. Belief should be easy because Paul says it’s “manifest” which I take to mean “obvious”. The Pascal’s Wager argument is hopelessly flawed, in a number of ways. 1. The cost of belief is not zero. In fact it can be very high, up to and including a drastically shortened lifespan. 2. According to Christian doctrine (AFAIK) one has to truly believe to reap the benefits. If you do, you won’t need this or any other argument; if you don’t truly believe, do you really think you can fool God into thinking you do? 3. Belief, even if you have made yourself believe, for mercenary reasons doesn’t count either. Neither does following all the correct rituals of the Church. 5. Further to 4. above: There is just as much evidence (as in, none) for the existence of Zeus, Odin, Ahuramazda, Brahma, Allah, or Yahweh as for the existence of the Christian God. AFAIK (which isn’t very far) all of these religions believe that non-belief in their version of the Supreme Being sends you to some version or other of Hell. Why pick the Catholic God (for example) instead of one of the others with whom to make the Wager? 6. (and finally) Pascal’s Wager makes God sound like the ultimate mobster. “Do what you’re told or spend an eternity in infinite agony.” Is such a being really deserving of your worship, if you have any sort of moral sense at all? Aquinas did not regard his arguments as proofs. He thought they were indications that God’s existence was probable. As to Anselm, I always have liked his “proof” because of its audacity. Now you should apply your logic to atheism. Atheism is clearly an extreme position of the God problem, and it is clearly not provable. Like Aquinas, you can make arguments that God does not exist, but they are not proofs, merely indications that it is possible. Also, most people argue against God’s existence from the demonstrable existence of pain and evil. But this argument tacitly assumes that God is benevolent. But Yahweh plainly isn’t, although he’s willing to accept endless apologies from Jews. So much for omniscience. In Christian theology, belief is insufficient for heavenly reward. Obedience (“deeds” in this passage) is required. Pascal loses his wager because of a faulty premise that belief is all that counts. (2) and (3) end up not being relevant, because the point of the Wager is not to make people believe, but to show certain kinds of agnostics when they are refusing to believe purely for irrational emotional reasons, and thus to remove an obstacle they are putting in the way of belief. That’s why Pascal explicitly considers the agnostic protest that even if Pascal is right, he can’t make himself believe; Pascal’s rejoinder being that if that’s the only problem, then it just means the agnostic should start living a life with fewer impediments to belief. Likewise, the Wager assumes for the sake of argument the agnostic assumption that there is no clear theoretical evidence in any direction; it points out that this assumption leaves practical reasons untouched, and that the agnostic can’t deny that practical reasons are relevant because suspension of judgment is itself a practical matter. However — and this is quite important — Pascal himself doesn’t accept the agnostic assumption that he concedes for the sake of argument; after all, the Pensees, in which the Wager is found, are fragmentary notes for a book arguing that Christianity is the true religion. From many of the Wager-related fragments, it seems clear that Pascal’s primary intent for the argument is as an introduction to this argument, to get agnostics to admit that they need to inquire actively rather than just assuming that they don’t need to do so. After all, it’s hard to find an impediment to belief more serious than not even trying to discover what should be believed. Given all this, the only criticism you note that has force sometimes against the Wager is (1). But, of course, to deploy it the agnostic would have to admit that the only reason they are suspending judgment is out of fear. It’s true that more than belief is needed, but belief at least is, which is why your argument is beside the point. 1. No matter what the cost, it is still finite. Even a shortened lifespan. 2. This is true, but irrelevant. The Wager does not assume you can fool God. 3. This is true: it is not belief per se, for even Satan believes. Instead, the commandment is to love God with all your mind, heart, and soul. Yet this is assumed by the Wager. 4. This was already admitted and is not a flaw of the Wager. You have forgotten the Wager’s assumptions. 6. This was Ken’s attempt, but it is false. Anyway, did you hope to get away with all your sin? I am really toying with the idea of writing a really good rebuttal to this one, and I am pleased that the Pascal’s Wager is eloquently put in one place so I can tear it apart. The probability exercises in themselves are fun. About Pascal’s advice of “pretending you believe until you do”, that’s actually a very fine and fair assessment of human’s psyche. That’s how it usually plays out although it’s far from perfect. A big part of the debate has to do with the use of infinites. Infinite happiness for infinity? What does that really mean? I would suggest nonesense, but who am I to say. Getting rid of a concept no one really understands would tear apart the Wager… On top of this, believing in a provider of infinite happiness (you do have do believe in this provider for the Wager to work) is akin to believing in God,turning this into a petitio principii. I offer a meta-analysis (I think that’s an appropriate term) of Pascal’s Wager, which IMHO comes to a conclusion against its premises. The Universe is vast utterly beyond our comprehension, both in temporal and spatial terms. Pascal’s Wager assumes that your belief in He who rules all, from superstrings to superclusters and from the destroying fires of the Beginning to the utterly dark and cold emptiness at the end of Time, actually matters to Him. It is at least arguable that your belief that your attitudes matter to a being like that is in itself a mortal sin which will inevitably send you to Hell. The sin of Pride. I was disappointed by many of the comments that seemed to ignore what was in the post. The problems arising from an infinite probability were noted (including the paradox of coin-tossing or lottery) as were the categories of those who could not accept the premises of the wager. What was surprising was that only one comment peripherally addressed the major flaw in the Decision Analysis argument–by presupposing an very large value for belief in God and a very small value for non-belief, one assumes the result the analysis is to demonstrate, i.e. begs the question. Nevertheless, if one does make those value assumptions, then the result does follow rationally. I myself feel (not a rational or logical verb) that faith is a matter of grace; one can be given a small seed and from that develop rationally a full blown faith, or like Saul on the Road to Damascus, be given an overwhelming vision of the truth. Hard-core atheism is much more a matter of faith (believing assumptions that can’t be verified empirically) than is belief in God. And a full-blown atheist is unlikely to be turned to God by rational argument, even if his faith-based propositions for atheism are totally demolished in debate (see the books of Keith Ward contra Richard Dawkins). I know of only one instance in which an eminent atheist (intellectual) came to a belief in God by rational argument–Anthony Flew. All the above is to say that the post was meant to show one road to faith–call it insurance for the agnostic–but it is certainly not the only road. I guess I always considered Pascal’s wager as “hedging your bet” and I just could not see God buying that as actual faith. 1) That I presented a from Edward J. Gracely is clear from the over reference to the source, Edward J. Gracely. FACT: The scenario states that precise possibility: “If she wins, she can go to heaven, but if she loses she must stay in hell forever.” Or maybe you mean something else…but is that something else so profound the point really isn’t made as it is? I seem to recall offering you (via email) an opportunity for a guest post a year or two ago (when you used to send me emails). I also put up other pieces by people I disagree with (recall Luis’s? DAV’s on causality? etc.). No. You made the mistake of thinking I wrote the piece and dislike admitting it. And your source was not “obviously” Gracely. You outlined the game approvingly, as if it were your own. And at last you quoted Gracely but did not credit him with originating the game. But that only makes both you and Gracely wrong. You pay a price if you lose or if you don’t play. The regret one feels on playing and losing would be different than that felt by not playing (and remaining in Hell). I have never quite understood the use of this statement by religious people. Not whether it is right or wrong, but the sense of it. Assuming that in religion faith is a plus, why make a statement that says in effect: you guys are worse than we are? Also since the usual complaint is that an atheist lacks faith, why this reversal? There is only one explanation to my mind. This is that the statement is made by a religious person who lacks faith and desperately needs a rational reason to believe and thus needs to paint the atheist as the possessor of the inferior attribute of faith. Please correct me if I am wrong. Scotian, pardon me if I attributed poor sense to atheists–there are as many brilliant minds amongst atheists as among theists, with the exception of some evangelical atheists, such as Richard Dawkins. My point was that you have to start with assumption(s)… If you’re an atheist and a great mind such as the physicist Steven Weinberg, you say “the more the universe makes sense the more it also seems pointless”(and if that’s so, why do physics?). That statement, without debating theodicy, the problem of evil is an article of faith–it can’t be demonstrated empirically (nor can its contrary). So you start from assumptions and then proceed rationally. As I said in my comment, above grace gives a seed for faith or the full-grown plant. I am sorry for those who have not been given that seed, and I certainly don’t attribute any moral or intellectual fault to them (as long as they don’t make silly arguments, like Richard Dawkins). Scotian, once more into the fray… I don’t think I explained myself fully in the last comment. My point, very briefly, is that to me there is much more evidence for a creating God and, to go further, to His only begotten Son, Jesus Christ. But I grant that to others this evidence is not there–for them the universe is due to chance, the historical accounts of Jesus and His resurrection are fabricated, the evil in the world contradicts any notion of a loving deity. And I say that belief in all this contradictory evidence is a matter of faith and entails as much (and to mind, more) faith–i.e. belief not fully supported by empirical evidence–as belief in its contrary. But there’s no way to prove that, just as I can’t demonstrate to my children that blue-grass played on the bowed psaltery is as excellent as 80’s rock. Thanks for responding. I have a few more questions. “My point was that you have to start with assumption(s)”: If this is the case, why use the word faith? Faith has a very different connotation than assumption. “â€œthe more the universe makes sense the more it also seems pointlessâ€(and if thatâ€™s so, why do physics? )”: I do not understand this complaint at all. The melancholy associated with a feeling of pointlessness can strike anyone. A major problem with the early church was a perceived pointlessness of life which lead to either passively waiting for the release of death or an active seeking of martyrdom. Such was the promise of heaven. “for them the universe is due to chance”: I have never met anyone who believes that the universe is due to chance. This seems like a straw man position. Are you by any chance referring to some sort of multi-verse theory? “And I say that belief in all this contradictory evidence is a matter of faith and entails as much (and to mind, more) faith”: You still haven’t addressed my original point. Which is, why would a man of faith portray faith as an inferior attribute. Shouldn’t you see this as a positive thing? “i.e. belief not fully supported by empirical evidence”: This is not the usual definition of faith. At best it is the switching back and forth between two usages of the term “faith” within the same argument. This doesn’t seem valid to me. As a fellow physicist I am interested in the origins of your religious faith and mean no disrespect. Scotian, thank you for your comment. The universe isn’t “pointless” to all great scientists–see, for example, the opinions of eminent scientists (including Nobel prize winners) in “Cosmos, Bios and Theos”. (I think the NYT reporter quoting Weinberg caught him in an unguarded moment.) Certainly absence of a belief in Deity will be a basis for the “pointless” attitude. I’m not sure I agree with your interpretation of the attitude of the early Christians–they did acknowledge a higher purpose; it was life on this earth that was pointless, and that attitude was also a tenet in Gnostic beliefs at that time. When I say “assumption” I mean a proposition or statement that seems obvious, for which proof (logical or scientific) is not necessary, and which is, therefore, in some sense a matter of faith–that is to say, one believes it without formal logical proof, without any evidentiary process, with an innate sense that it’s true; here are some examples: every event can be explained by physical laws; some realms of knowledge lie outside the domain of science; the mind is totally a material thing (or the contrary, the mind is totally a non-material thing), etc. Those propositions are articles of faith, for which ARGUMENTS rather than proofs can be given. As I define faith, it is belief which is supported (but not confirmed) by empirical evidence or by an inner sense that the proposition is true. And perhaps I should have used Humpty-Dumpty’s rejoinder—“When I use a word,” Humpty Dumpty said, in rather a scornful tone, “it means just what I choose it to meanâ€”neither more nor less.” In math you’d call an assumption a postulate. Your supposition that the term “random” implies a belief in the multiverse (said belief also being an article of faith) is correct–that our finely tuned universe exists as a highly improbable event because so many different universes also exist. While I’ve never seen any of the metaphysical cosmologists who believe such nonsense, there are many of them cited in the literature. And to your last remark: my religious (as distinguished from scientific) faith, like Topsy, just growed. I’m trying to write the story in a blog “Top Down to Jesus–Bypassing the Road to Damascus”, but it has had an elephant child gestation period. Maybe in another few weeks. Thank you for your interest. Ignoring for the moment that Briggs dislikes the word chance let’s apply the concept to an ideal gas in statistical mechanics: a textbook example where we have a two chambered container and a valve between them. In one chamber there is an ideal gas at a pressure P and in the other vacuum. The valve is initially closed and we will assume an isolated system with a uniform temperature. The valve is then opened and assume that the passageway is large so that we can ignore effusion. We all know what will happen next: gas molecules will move between the chambers until the pressure on both sides is the same. Why does this happen? For our ideal gas example the molecules do not interact and thus there is no hydrodynamic flow. There are no forces to move a molecule from one chamber to another. The pressure that I referred to only applies to the walls of the chamber. This is free expansion and happens entirely by chance. The moral of the story is: do not underestimate the power of chance. If you say chance, then what you’re doing is to apply a probability to the movement of a particular molecule. That isn’t the way statistical mechanics is done–it applies to an ensemble, and the ensemble properties are what are predicted by statistical mechanics. Here’s the only way probability could be applied to this expansion: you have a sample of gas with one radioactive molecule. You carry out the irreversible expansion. When equilibrium is reached, the probability is 1/2 that the radioactive molecule will be in the left-hand chamber and 1/2 in the right. That is to say, if you carry out a large number of such experiments, approximately half the trials will have radioactivity in the left-hand side and approximately 1/2 in the right. That is the only sensible and non-paradoxical probabilistic interpretation. By the way, there is a related problem to the one you posed: the so-called Gibbs Paradox, in which one considers the entropy of mixing for the partition lifting (gas on both sides) if 1) the gases are different or 2) the gases are the same. Lande used this to derive quantum mechanics. Bob – Indeed. There is a calculable chance that at some future time (say within the next ten minutes, for the sake of argument) the left and right-side densities of the gas will be different by any given factor. For example, left side density is lower by 50%. However, the chance is tiny. So tiny, in fact, that for any macroscopic size of chamber one would almost certainly be waiting for many times the age of the universe even if nothing else happened in the meantime. You have just said the same thing in different words. Increasing the complexity of the explanation does not change my basic point. For a more creative example consider the growth of a snowflake. The approach to equilibrium can be a long and wonderous journey. This is the essence of life (individual or universe). Scotian, you’ve touched on a profound and mysterious issue–what is the role of chance (or probability) in so-called physical laws. I have not given a good explanation or reply, and I think a whole post could be devoted to this, including whence the Second Law (see “The Road to Reality”:Chapter 27, by Roger Penrose). And also what means probability in quantum mechanics? So, until I can frame a coherent (to me) account, I’m out of here. Thanks for the question.